Have you ever been at a point in your life where you feel like giving up? It might be that your marriage is falling apart…or you can’t seem to find a job…or you are in so much debt…or you feel like you are the only single one left…you are so ill and the doctors can’t seem to find a cure…you work hard in school, but your grades never reflect that…your heart was broken by someone you gave your all to. …and when these moments come…you begin to think “God…why have you forsaken me?” or begin to feel like you don’t deserve any of this. God loved Jesus; He declared His love for Jesus when he said “This is my Son, whom I love; with him I am well pleased (Matthew 3:17).” And at the end of everything, even though Jesus died for our sins, he got the greatest blessing: He is, today, seated at the right hand of the Father (Mark 16:19). Now, we know that God loved Jesus…but He still made Jesus suffer for our sins. He did this because he loves us so much and wanted us to have a second chance at eternal life (John 3:16). When we face the storms in our lives, especially when we have faithfully served God; it is because He trusts us so much and He believes that we are strong enough in our faith to “suffer” in the world in order to receive eternal life in exchange. He holds us in high regard…just like he held Jesus. 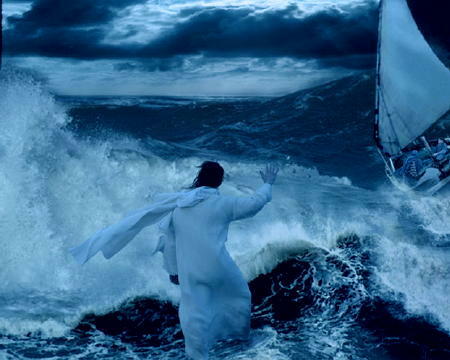 He knows we can handle it…and he wants us to try to be perfect…just like Jesus was perfect (Matthew 5:48)…and He is using these storms to prepare you for His plans. God will NEVER give you more than you can bear (1 Corinthians 10:13)…He has given you direct access to Him, so that when the storms seem too strong for you to bear, you can come to Him and he will calm the storms (2 Corinthians 1:8-10). God is not pleased to see you suffer. He loves you and that is why He constantly gives you multiple opportunities to come into His presence. His plan is to fill your lips with testimonies…but what is a Testimony without a Test? Now…your test might last longer or seem greater than others…but remember that God always remains faithful (consider reading the book of Job). Some other times, we face storms because we have not served God like we should. The only times some of us remember God is when we need something. So, when God misses us so much, and He knows that we will definitely come to him when we need Him, he brings the storms our way so that we can come into His presence…and hopefully, stay; even after the storms have calmed down. Therefore, do not let the storms shake your faith, but instead, fill your lips with testimonies and gratitude for the opportunity to prove yourself worthy of the kingdom and in the end, you will surely overcome (Revelations 12:11). Don’t worry about the things of the world…because these things will surely pass away…but the Kingdom of God is eternal for those who live righteously (1 John 2:17). Remember, it does not profit you to gain the world (face no storms in life) and lose your soul (live eternally in hell fire). Eternity is so much longer than the number of years we spend on earth. Our prayer is that the storms we face will draw us closer to our Father in Heaven. This entry was posted on Thursday, January 10th, 2013 at 7:09 am	and posted in Thought Provoking. You can follow any responses to this entry through the RSS 2.0 feed. Most times the devil try to capitalize on our storm time to challenge the word of God in our lives and it seems he is winning that God has forsaken us but sorrow may last for a night joy always come in the morning. It is sure and God can never lie. I have been trough a lot in my life but through it God always send His peace before the trial , during the trial and after the trial. Brethens, God is faithful and that is one truth you can hold on to. God bless you!